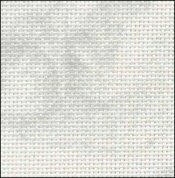 Stormy Clouds Lugana 25ct Short Cut 36x55 with flaws [9999.4778] - $43.12 : Yarn Tree, Your wholesale source for cross stitch supplies. 25ct Lugana Zweigart fabric. SHORT CUT - ONLY ONE PIECE AVAILABLE OF THIS SIZE. 52% cotton, 48% viscose. There is a 12" long red line flaw 14" from cut edge. This piece has been discounted 20% OFF the regular price.